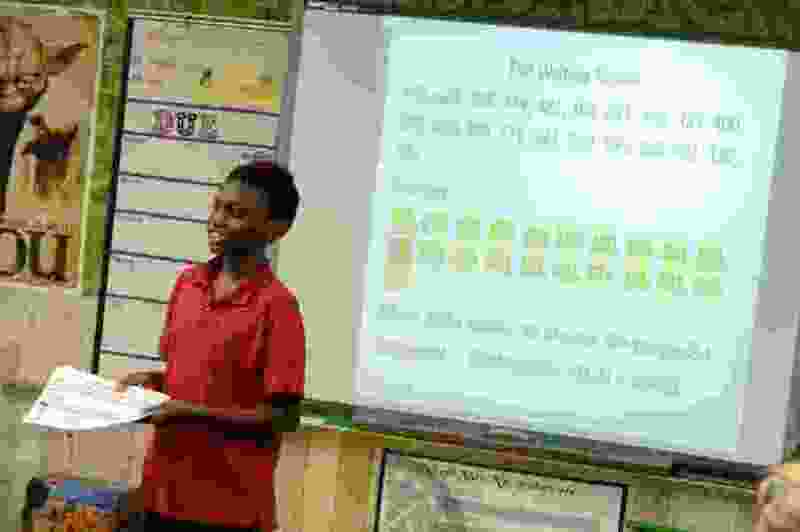 (Francisco Kjolseth | Tribune file photo) Antwone Moore, 12, presents information about his classmates' increase in SAGE test scores at North Star Elementary in May 2018. Sharon Moore, a sixth-grade teacher at the school, had agreed to dye her hair as an incentive; the offer helped push her kids' scores up nearly 17 percent. Utah’s public schools are poised to take a hit from parents who excuse their children from year-end tests. After its series of requests for flexibility from federal education laws were denied, the Utah Board of Education has agreed to count opt-outs as students who took tests but failed in order to achieve a minimum participation rate of 95 percent. That means schools with high numbers of students who opt-out of assessments — including many charter schools and some school districts — could see their performance ratings plummet, as those children are awarded zero points for the purpose of accountability calculations. The ratings are used in programs like Title 1, school grading and school turnaround efforts. The change in policy is part of Utah’s plan to comply with the Every Student Succeeds Act, or ESSA, which mandates that at least 95 percent of students participate in annual testing in grades three through eight and at least once in high school. Utah’s plan was approved Thursday by the U.S. Department of Education, following several delays as the state requested and failed to receive a waiver from the participation requirements, or a one-year reprieve from ESSA’s mandate. The number of parents excusing their children from year-end tests has steadily increased as Utah’s testing system, SAGE, has fallen out of favor within the education community. Opt-outs were originally fueled by skepticism toward the Common Core State Standards — upon which Utah’s grade-level benchmarks and testing systems are based — but later ambivalence toward programs like school grading led educators to de-emphasize test scores. State law prohibits schools from encouraging participation in year-end tests, or using test scores in the calculation of a student’s semester grades. But the scores are used in the allocation of state and federal resources to support and improve struggling schools, despite criticism from teachers that children do not take the tests seriously, if they take them at all. In 2017, 5.9 percent of students statewide opted out of year-end testing, putting Utah below the 95 percent threshold for participation. The opt-out rate was even higher among charter schools, where 13 percent of students were excused from testing. And at five charters, the majority of students declined to participate. Data for the 2017–2018 school year is not yet availalbe. Terry Shoemaker, executive director of the Utah School Superintendents Association, said it seems counterintuitive to allow parents to excuse children from tests that form the backbone of school accountability systems. In 2017, roughly one in five students in Park City School District opted out of testing, the highest rate of Utah’s 41 school districts. Many of those students were among the highest-performing in the district, Park City technology director Andrew Frink said, but they saw little reward for taking a voluntary test with no personal stakes. Last year, Park City School District received its first-ever "F" grade for one of its schools — at Treasure Mountain Junior High — prompting a letter from administrators to parents that effectively dismissed the test scores and grades as immaterial. And giving a score of zero to any student to declines participation, Frink said, would only further erode the integrity of the assesment data. “Given the opt-out numbers, we don’t consider those test scores to be particularly representative,” Frink said. The Utah Board of Education recently adopted new year-end testing systems to replace SAGE in the 2018–2019 school year. Elementary and middle school students will take the RISE test — an acronym for “Readiness. Improvement. Success. Empowerment” — while high school students complete the Utah Aspire Plus test, a hybrid of the ACT-prep test “Aspire” and Utah’s SAGE question bank. Frink was optimistic that participation could improve under the new testing systems. He said SAGE was a good test, but that students may find it more beneficial to take Utah Aspire Plus as it will help prepare them for college entrance exams like the ACT. Utah’s ESSA plan states that opt-out students will be counted as failing only when the participation rate falls short of 95 percent, and that schools with high opt-outs will be audited to identify the root causes of low participation and subject to remediation to improve participation. It is not specified in the plan what that remediation would entail. Tiffany Stanley, chief of staff to Superintendent Dickson, said the impact of the new calculation policy will be mitigated this year, as school grading is currently suspended while the Utah Baord of Education develops a new grading rubric. And the state’s approach to turnaround programs will likely be tweaked to avoid investment in otherwise high-performing schools that only fail on paper as a result of high opt-out rates, she said. Without a change to education law, the requirement to attribute a score of zero to opt-out tests could lead to contradictions between state and federal accountability programs, Stanley said, similar to the multiple — and occasionally conflicting — report cards awarded to schools in the early days of school grading. “If opt-out continues to increase, it makes it much more difficult to have our federal and our state accountability systems allign,” Stanley said. Alisa Ellis, a member of the state school board and proponent of parental rights, said individual choice in education should be respected. She said the plan to count opt-outs as failing is not a perfect solution, but it opens the door for a dialogue on how to balance the rights of parents with the desire to track educational performance.